Call it by any name—Mikado or Shanghai—good ol’ Pick-up Sticks has always been a favourite skill-based game. Played with a few sticks, all you have to do is gather a few sticks in a heap and let them fall free on a surface. What follows next is a strategy game, even as you go about picking up the top-most of the heap right down to the bottom-most. 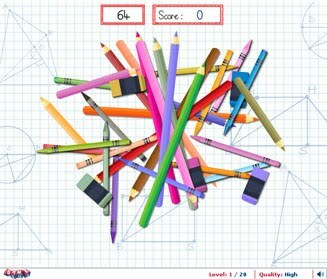 Scatterbox is the cool, virtual version of the afternoon favourite with a colourful and bright stationery twist! Choose from Rookie, Master, Expert or Pro levels. Left-click on the top-most object in the heap to clear the board. Click on the red ants before they reach blinking point. Click on flies to collect bonus points. Keep a tab on the timer!